Combining all the space, style and practicality of our flagship range with a revolutionary sporty silhouette, the Superb SportLine takes an iconic design to the next level. The dynamic exterior and luxurious interior is matched by outstanding performance and, with a 2.0 TSI 206kW engine standard, the Superb SportLine ensures your driving experience is superior to any other. Sophistication just got a sporty makeover. Introducing the newest addition to the award-winning ŠKODA Superb model range – the Superb SportLine. Combining all the space, style and practicality of our flagship range with a revolutionary sporty silhouette, the Superb SportLine takes an iconic design to the next level. The dynamic exterior and luxurious interior is matched by outstanding performance and, with a 2.0 TSI 206kW engine standard, the Superb SportLine ensures your driving experience is superior to any other. We hope you never need the nine airbags that come standard in every SUPERB SPORTLINE Wagon. Located at the front, front side, rear side, curtain, and driver's knee area, they help protect you and your loved ones in the event of a collision. Here’s something you might not have seen coming. Side Assist (Blind Spot Detection)Δ◊ helps you change lanes safely by letting you know when a vehicle is in your blind spot. If so, an LED symbol in the side mirror will light up, and start flashing once you indicate. It also takes corrective action if there is a car in your blind spot. ΔIncluded in optional Image Pack. A car that braces for impact? That’s seriously smart. Passenger Protect Assist uses information from the car’s braking and electronic system to ready for impact when there is a high chance of collision. In such an event, the front seat belts will tighten and the sunroof (if equipped) and windows will close to keep you in the best position for airbag deployment. Our clever engineers have developed a hands-on approach to help identify driver fatigue. Fatigue Detection◊ monitors your movement through the steering wheel. If it senses signs of fatigue, it triggers an audible and visual warning alerting you that you need to stop and rest. To veer is human. Lane AssistΔ◊ uses a camera positioned within the rear-view mirror unit to actively recognise lane markings and, if you begin to stray, take corrective action to gently steer you back on course. It will also send audible and visual messages if you need to take additional action. The SUPERB SPORTLINE Wagon is designed to be seen — during the day, and at night. Innovative lighting systems, including front headlights fitted with Bi-Xenon technology, Adaptive Frontlight System (AFS), and LED daytime running lights, ensure you can see and be seen, at all times. The rear features striking LED lights and two reflectors on each side of the rear bumper, included as standard. Some forward thinking for when you’re going backwards. A rear view camera◊, helps you back out of your driveway with peace of mind and tackle those tricky reverse parks with confidence. Here’s a feature that won’t surprise you. When you’re reversing, Rear Traffic Alert◊ recognises vehicles approaching from the sides and alerts you with an acoustic signal. If necessary, the brakes are automatically applied to help prevent any collision. The Last thing we to happen to you immediately after an accident. Electronic Stability Control (ESC) helps you maintain control of the car if it begins skidding, using ABS (Anti-locking Braking System), ASR (Anti-Slip Regulation) and other special sensors to prevent slipping or locking the wheels. The SUPERB SPORTLINE Wagon has got your measure. Featured on the infotainment display, the Performance Monitor lets you fully enjoy the car's sporting pedigree. Customise the monitor to show Bar Pressure, G-Force, kW's, engine temperature, oil temperature and lap times. Sometimes you just need your space. The SUPERB SPORTLINE Wagon offers ample room in all directions for you and your passengers. Specifically, the interior offers 1507mm in width, with 991mm of headroom for the driver and front passenger. When it comes to air conditioning, it’s each to their own. Three-zone Climatronic air-conditioning allows the driver, front passenger and rear passengers to set their own preferred temperature independently. At the same time, an enhanced air filtration system improves cabin air quality, reducing dust and pollen. We’ve turned the boot door into a hands-free device. The new Virtual PedalΔ lets you open and close the boot simply by kicking your foot underneath the rear bumper — convenient for when your hands are tied with loads of shopping. It shouldn’t take you long to get comfortable with the sports style interior. Settle into Alcantara® leather-appointed sports seat upholstery in black°, featured as standard across the SUPERB range. °Leather appointed seat upholstery have a combination of genuine and artificial leather, but are not wholly leather. The SUPERB SPORTLINE Wagon will even get your seat for you. Each is equipped with electrically-adjustable driver seat with memory function — storing three separate positions of the seat and external mirrors. An electrically adjustable front passenger seat is available in the optional Comfort Pack. We’ve packed a lot of clever features into the SUPERB SPORTLINE Wagon, but still left plenty of room for your luggage. In fact, at 625 litres, the luggage compartment is top of its class. No cables, no worries. Now with the Qi Wireless charging in the centre console, you’ll never get caught with a flat smartphone. Available with standard equipment. Driving gets a lot trickier when the conditions keep changing. Adaptive Chassis ControlΔ continuously evaluates and responds to various driving situations (acceleration, braking, turning), adapting the damping and steering characteristics to give you more control. This can also be set manually to the drivers preference. You know what else sounds great? The Canton Sound SystemΔ delivers 610W output across 12 high-performance speakers: 10 in the side doors, one centrally located in the dashboard, and a sub-woofer in the boot. Enjoy the convenience of having the stereo, Columbus Navigation System and trip computer all in one system. To make things even easier, the proximity sensor lets the touchscreen know when a hand is moving towards it and automatically brings up the function buttons, while intuitive swiping and pinching make it easy to move around menus and maps. Just when you thought cruise control couldn’t get any smarter. Adaptive Cruise Control (ACC)◊Δ features a radar sensor on the front grille, allowing it to automatically brake and accelerate to a speed and distance set by you. Did we mention it comes standard? You won’t be the first person to search for the parking brake. 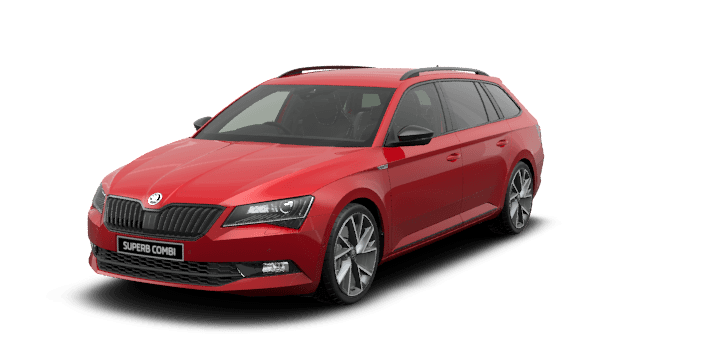 The new SUPERB SPORTLINE Wagon is the first ŠKODA to feature an electronic version — increasing space, safety, and comfort. The Auto Hold function prevents the vehicle from rolling away at standstill or when pulling away, without you having to touch the brakes. A car that gets the door for you? Now that’s service. KESSY can be added so you can lock and unlock your car, and start and stop the engine without having to insert or even handle the key. It’s always a good idea to build in a little buffer. The new surround parking sensors complement the Park Assist and work together with all of the infotainment systems. Parking doesn’t get any easier than this. With a press of a button, Automatic Parking AssistΔ◊ will begin searching for a parking space in a line of cars or other obstacles. When found, the car will steer itself into the space while you simply control the pedals. How’s that for assistance? We hope you like attention. The SUPERB SPORTLINE Wagon is instantly recognisable by its black design features including darkened fog lights, glossy black side door strips and black trim on the lower grille. Its sporty aesthetics include 19” Vega anthracite alloy wheels, black rear diffuser with twin chrome exhaust, and glossy black rear spoiler. We’ve kept some things just for you. Enjoy a carbon décor, Alcantara® leather sports seats°, and three-spoke multi-function sports steering wheel. Set the ambient lighting with fibre optic elements and 10 different colour LED options — illuminating the dashboard, door rims, door handles, seats and foot wells. °Leather appointed seats have a combination of genuine and artificial leather, but are not wholly leather. Under the hood, we've over-delivered. Enjoy our flagship 206Kw TSI petrol engine, fitted with state-of-the-art all-wheel drive, guaranteeing optimal driving dynamics, high levels of active safety, and economical fuel consumption. The SUPERB SPORTLINE Wagon is a bit of a control freak. The 206TSI is fitted with state-of-the-art all-wheel drive, guaranteeing optimal driving dynamics, high levels of active safety and economical fuel consumption. Torque distribution to all four wheels is automatic and always depends on the driving environment. The only area we’ve cut back on. The fuel consumption and low CO2 emissions of the new SUPERB SPORTLINE Wagon outperform its competitors. All engines feature Green Tech as standard, including a Start-Stop System~ and brake energy recovery, saving fuel in city driving. ~Deactivation of Stop-Start function will not occur in certain conditions. ^5 Year/Unlimited Kilometre Warranty is available with private, general fleet and government vehicles only. Excludes rental vehicles, hire cars, taxis, courier vehicles, driving school vehicles, security vehicles, bus and tour vehicles which are subject to a 5 Year/150,000 Kilometre Warranty (whichever occurs first). Your rights under this warranty sit alongside the consumer guarantees under the Competition and Consumer Act 2010 which cannot be excluded. Click here for 5 Year Warranty terms and Conditions. *Manufacturer's Recommended Driveaway Price (MRDP) is an average, estimate price which includes the recommended retail price, 12 months private registration, 12 months compulsory third party insurance (CTP), an estimated dealer delivery charge, stamp duty, options entered during the configuration process, and other applicable statutory charges. Options and metallic paint may be available for an additional cost. Please see your local ŠKODA dealer to confirm your individual price. The above pricing does not take into account any campaign/promotion that may be current in relation to any of the above models. For information regarding any current campaign, please contact your local ŠKODA dealer. ŠKODA Australia reserves the right to change, supersede or extend all offers at its discretion. +Safety technologies are not a substitute for the driver's responsibility of the vehicle. **Included in optional Image Pack. ºLeather appointed seat upholstery have a combination of genuine and artificial leather, but are not wholly leather.